Now is our own mobile-ready! 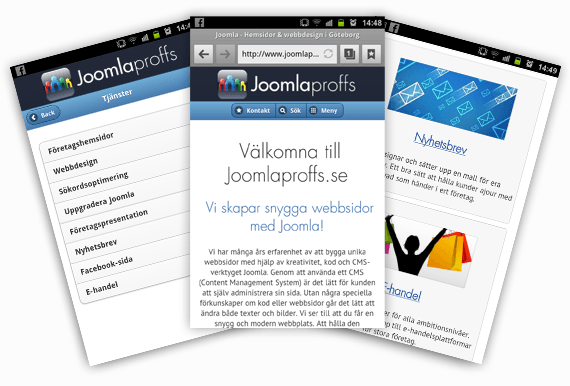 With mobile-optimized websites in Joomla you make it easy for visitors from smartphones to navigate on your side. With quick links to contacts via telefunnummer and e-mail, make sure that it will be easy for your customers to easily get in touch when they are on the loose with his smartphone in hand. Mobile fitting that is made here based on jQuery Mobile that allows entire Web page feels like an iPhone app. We want to note that this is all the information from our regular website. There are many sellers who call these days and offers a façade with a simple landing page that going mobile. We think the Joomlaproffs is both sloppy and wrong. We think it is important to integrate Joomla websites properly with a well-made mobile custom template that provides the "real" page. how it might work when done properly!